The March issue of NARC. magazine is available now, free of charge from over 200 outlets across the North East. 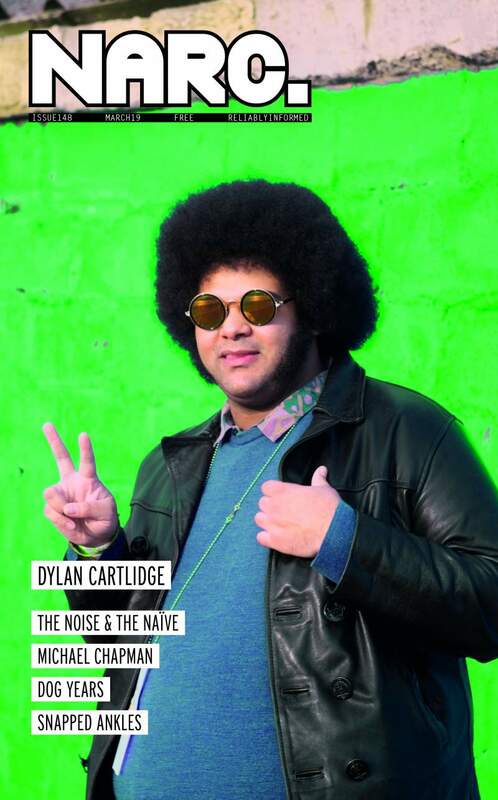 Our cover star this month is Redcar’s Dylan Cartlidge. Ahead of the release of his new EP, and with a huge year ahead of him, Dylan talks to Nick Wesson about connecting with his audience and maintaining a positive outlook. Exclusive images by Nick Wesson. In the News section, we preview Fling at Westgarth Social Club; The Coral at Middlesbrough Empire; Laura Jurd & guests at Sage Gateshead; Plumhall at Toft House; Gemma Ray at Cobalt Studios; Eddie & The Valkyries at TSOne; Dylan Carlson at The Cluny; Tunnel Club at Little Buildings; Swine Tax at Star & Shadow Cinema; Hope & Social at ARC and much more. In the Culture pages, find out about Sunderland Shorts Film Festival, which takes place in May; there’s a focus on emerging voices at Live Theatre’s Elevator Festival; we profile artist Kelly Richardson and playwright Sian Armstrong; plus previews of My Mental Breakdown: The Musical at The Exchange; Velvet Petal at Dance City; The Cult of K*nzo at ARC and Northern Stage; No Such Thing As A Fish at Tyne Theatre & Opera House; Women of Tyneside festival; The Odyssey at Arts Centre Washington and Middlesbrough Theatre; Rob Auton at The Stand and ARC; Trainspotting at Northern Stage; Holly Argent at Tyneside Cinema; Feliks Culpa at Vane Gallery and Johnnyx at B&D Studios. Plus there’s reviews of Tom Stade, Justin Moorhouse, Approaching Empty, Digital Citizen, Anna Nicholson and We Are Bronte. Catharina Joubert talks to iconic guitarist and songwriter Michael Chapman about his new album, avoiding boundaries and Northern pride ahead of his Cluny gig; Charlie Isaac talks to indie rock quartet Fossway about the release of their new single this month; Mark Corcoran-Lettice talks to both halves of The Noise & The Naïve about their exciting new EP; Becca Fergus talks to Death Valley Girls’ Bonnie Bloomgarden about reviving rock ‘n’ roll, ghosts and eating fast food with rock royalty; Johnathan Ramsay talks to Newcastle hip-hop experimentalist J SMXRK, as the enigmatic musician looks to reinvent himself in 2019; Ben Lowes-Smith talks to Snapped Ankles about their bizarre and exciting mythology; Damian Robinson talks to Hartlepool’s indie heroes Para Alta about being tipped for greatness; Dog Years’ debut album may have been ten years in the making, but Damian Robinson discovers it’s more than worth the wait; and, as Teesside music charity Tees Music Alliance celebrate the 25th anniversary of making Stockton’s Georgian Theatre their home, Claire Dupree speaks to Paul Burns about their plans for the future. In Mixtape, the bods behind alternative club night No Wow explain how they get the party started. We review demos by Suddenly We Stopped Dreaming, Kkett, The Unidentified, Chris Darby and Wolfstig feat. Alan Travers; albums by 11Paranoias, brb>voicecoil, Deafkids, The Comet Is Coming, Self Esteem, Lower Slaughter, Lambchop and more; plus there’s reviews of singles by Creegan, Julie Grant, Salsola, Zak Younger Banks, Talk Like Tigers and Jister among others, and live reviews of Warm Drag, Thomas Truax, Rob Heron & The Tea Pad Orchestra, Homeboy Sandman, Leah Senior, Broken Brass Ensemble, The Young’Uns, White Lies, Wrekmeister Harmonies and more.